One of the Culinary Club’s favorite nights is fondue night. The retro dip seems complicated, but it’s actually as simple as it is delicious. 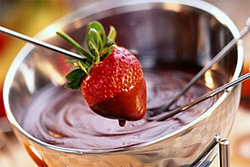 Perfect for a party or homemade dessert, chocolate fondue is especially easy. Just remember, it’s all fun and games until someone gets burned by boiling chocolate. Dippables: strawberries and bananas are fondue classics, but you can try almost anything. Apples, marshmallows, bits of angel food cake are all great options, too. Warm the cream over moderate heat until tiny bubbles show and begins to lightly and slowly boil. Add the chocolate and whisk until smooth and fully incorporated. Arrange your dippables on a platter or plates around the chocolate pot. Use a fondue fork, bamboo skewer, seafood fork, or salad fork to dip the fruit pieces and other dippables into the hot melted cream chocolate mixture. If the fondue begins to feel a little stiff, add a tablespoon of heavy cream and stir. It will help it go a little longer. Eventually, it will cook down though and you may need to start a new pot. Let’s face it, dining hall food can get a little predictable. Though there is something undeniably comforting about knowing there will be mashed potatoes every other Wednesday, even non-gourmet palates tend to crave a bit of culinary adventure. The IC Culinary Arts Club is the perfect refuge for students who long for a custom-made meal. 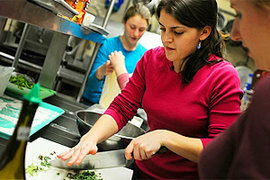 Students who like to cook have the opportunity to use a campus kitchen to whip up some delicious dishes. The club receives funding from the Student Government Association, and members subsidize their budget by baking and selling pies at the annual Apple Harvest Festival on the Ithaca Commons. The group also hosts the occasional bake sale. The money raised is used for ingredients and cooking supplies for the rest of the year. The club meets every other week in a kitchen. Each meeting has a theme, such as Italian night, Mexican night, or fondue night, and the members attempt to make the culinary classics from scratch. On Italian night, dishes may include such favorites as chicken with fettuccine, chicken Parmesan, eggplant Parmesan, and lasagna. Mexican night features tequila chicken, empanadas, and quesadillas with chorizo. Fondue night, featuring both savory and sweet dips, is always a hit. Most members get their recipes off the Internet. “It’s really convenient, especially because most students I know don’t have cookbooks in their dorm rooms,” says Shawn Flader ’10, club president. Other members opt to make exotic new concoctions such as Thai pizza, a pizza crust topped with peanut sauce, carrots, bean sprouts, chicken, Swiss cheese, and chopped peanuts. These experiments can even turn out better than old standbys. After the club members finish cooking, they get to enjoy the fruits of their labor. “On the night of the meeting we come in and cook the recipes, then we all sit down and eat it together family style,” says Danine Dibble, the group’s adviser. The group also reaches out to the Ithaca community. They have raised money for Loaves and Fishes, and have cooked and dined with Longview senior community residents. The lure of delicious food entices students to the kitchen to participate, even on cold winter evenings. There’s also the kitchen camaraderie that draws members back every meeting. “It’s a very relaxed environment,” says Flader. “Everyone is very cooperative and we help one another. For me, it’s the one time during the week when I don’t have to worry about what homework I have, just about which dishes I want to try the most." Sounds like a great club. I love cooking and eating as well.